Good evening, dear readers. 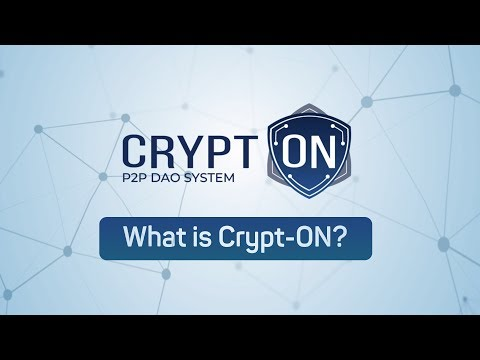 Today I want to introduce you to a new but promising project.Crypt-on is a financial platform that combines various methods of p2p payments (including credit micro-loans), but based on blockchain and cryptocurrencies. In fact, we have already passed all this, but I would not focus Your attention on an ordinary project, which Crypt-on is not exactly. It is no secret that mankind has tried to regulate financial relations with the help of Contracts. Sometimes it was a successful event, sometimes not very much. As sooner or later we all face scams and their inventive mind, able to circumvent the regulated rules. In fact, Crypt-on is a place to make secure financial transactions. Where people can look for performers for work or work on the other side. Can search how to invest money for a short time, while other people will be looking for short-term loans, etc read More about all the services we discuss later in our article. But the main thing that should be highlighted is that all these transactions will be transparent and secure, because they use blockchain and smart contracts. And all transactions will take place in cryptocurrency - and this will also have a positive impact on the market as a whole. Once again, all the fulfillment or non-fulfillment of smart contracts will affect the reputation of the system participants. If the participant will have any problems-he can always appeal to an independent arbitration, the results of which will be decided - who to raise the rating, and who to lower. Such a system in the future will allow to form a separate community of crypto-enthusiasts who will be able to implement their most daring ideas and ideas, form teams, hire the necessary specialists, receive loans - all without departing from the computer and the Crypt-on platform. In this case, regulated and centralized institutions, such as banks or public financial institutions, have always enjoyed greater confidence. But today we are ready to change traditions. Digital currencies have shown us in recent years that money can be decentralized. Crypt-on will use these technologies to the full. 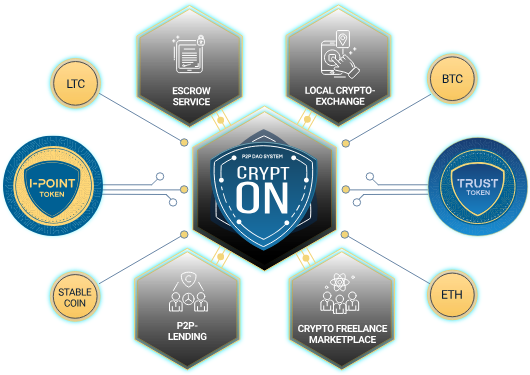 Basing the financial platform on already known and safe instruments, Crypt-on will lay a new concept of the consumer financial market. Each transaction conducted on the platform will not only be recorded, but also provided with a special "trust token", which is issued by Crypt-on. In addition, the level of confidence in the participants of the transaction will be formed. And this level will be transformed into a visual rating, which will then become the basis of Your safe transaction in any direction! I think that this should be discussed in more detail and highlight the main activities of the platform Crypt-on. Yes, to guarantee financial solvency, you still have to use banks at the highest level (for example, to provide risk insurance with gold and foreign currency deposits), but at the consumer level, this need has already disappeared. The blockchain and smart contracts gave us the necessary tools when the fraudsters it is extremely difficult to come close to deception of the user, and even if it happens, then we can track them down, to stop, to close the possible risks. Conduct absolutely secure transactions in cryptocurrency with the help of an independent judge (Escrow service). In this case, the insurance of transactions will be used! Service on selection give loans to. Any member of the system can participate in p2p lending in any role. Here, an independent and transparent rating system will be useful, which will reduce the risks of getting to an unreliable borrower to a minimum. Service to find work and employees. It will be a kind of freelance exchange that will work through smart contracts. This completely eliminates the possibility of non-payment of remuneration or failure to perform the task. Service for local cryptocurrency exchange. Allows you to find the best exchange offers based on your location. You no longer need to use remote services that insure your risks, including high interest rates. It is possible that the exchange in Your region will be much more profitable. Given the opportunities and ease of participation, Crypt-on plans to attract to participate those who do not share the idea of the cryptocurrency future. Token Generation Event or TGE (this is an analogue of ICO, only legally allowed in the US and regulated by the SEC) will be held from October 1 this year to January 21, 2019. A total of 200 million IPT tokens will be issued. Crypt-on pay attention that their token will not be a cryptocurrency in the broad sense of the word. This is the so-called "utility" token that will be used within the platform to pay for various functions. At the same time, it can be purchased on exchanges for traditional cryptocurrencies or money. The SoftCap of the project is set at 4 million USD, HardCap - 16 million USD. If as part of the sale of the tokens will reach the SoftCap, HardCap but not assembled, all unsold tokens will be burned. 3% is allocated on the bounty. 5% will be spent on legal expenses; on remuneration of project consultants, and on implementation of decentralization on the platform. As for my opinion, this time I will try to be restrained in my assessments. The platform definitely has an interesting vision, but not the most innovative product. Yes, I have MVP, which speaks of seriousness. Very well written Whitepaper project, focusing on key points. But then the fun begins when it is finished TGE, but successfully or not successfully it will end - depends, including On you.